Nationality: American. Born: Betty Joan Perske in the Bronx, New York, 16 September 1924. Education: Attended Julia Richman High School; American Academy of Dramatic Arts, New York. Family: Married 1) the actor Humphrey Bogart, 1945 (died 1957), children: Stephen Humphrey and Leslie Howard; 2) the actor Jason Robards, 1961 (divorced 1973), son: Sam Prideaux. Career: Began modeling, also theater-related odd jobs, early 1940s; made New York stage debut as walk-on in Johnny Two-by-Four , 1942; appeared on Harper's Bazaar cover and attracted attention of director Howard Hawks; signed personal contract with Hawks who changed her name to Lauren Bacall, 1943; made film debut in Hawks's To Have and Have Not with Humphrey Bogart, 1944; contract sold to Warners, mid-1940s; protested against HUAC in Washington with Bogart and other celebrities, 1947; fined and suspended by Warners for failing to accept roles, late 1940s; had first Broadway starring role in Goodbye Charlie, 1959; accepted periodic film roles while making highly successful Broadway appearances, from 1960s. Awards: Best Performance by an Actress in a Supporting Role in a Motion Picture Golden Globe, Outstanding Performance by a Female Actor in a Supporting Role Screen Actors Guild Award, for The Mirror Has Two Faces, 1996. Address: c/o Johnnie Planco, William Morris Agency, 1350 Avenue of the Americas, New York, NY 10019, U.S.A.
Lauren Bacall by Myself , New York, 1979. Now , New York, 1994. "No Chicken for Bacall," interview with P. Ast, in Inter/View (New York), November 1972. "Brève recontre avec Lauren Bacall," interview with A. Lacombe, in Ecran (Paris), June/July 1975. "All about Betty," interview with Kevin P. Buckley, in Interview (New York), March 1988. "What Becomes a Legend Most," interview with James Kaplan, in New York , 10 October 1994. Goodman, Ezra, Bogey: The Good-Bad Guy , New York, 1965. Huston, John, An Open Book , New York, 1972. Hyams, Joe, Bogart and Bacall: A Love Story , New York, 1975. Greenberger, Howard, Bogey's Baby , London, 1976. Parish, James, The Forties Gals , Westport, Connecticut, 1980. Royce, Brenda Scott, Lauren Bacall: A Bio-Bibliography , New York, 1992. Thomson, David, "Lauren Bacall: A Look and a Voice," in Close-Ups: The Movie Star Book , edited by Danny Peary, New York, 1978. Buckley, Michael, "Lauren Bacall," in Films in Review (New York), May/June 1992. Morris, Bob, "Just Shooting the Breeze," in New York Times , 19 September 1993. Haskell, Molly, "To Have and Have Not: The Paradox of the Female Star," in American Imago , Winter 1993. The Advocate (Los Angeles), 27 December 1994. Lauren Bacall's rise to fame as a Hollywood star was meteoric. Soon after Mrs. Howard Hawks noticed her on the March 1943 cover of Harper's Bazaar , the 19-year-old model was quickly signed by producer-director Hawks to a seven-year studio contract. For her first film, To Have and Have Not , Hawks molded the as yet untried actress into the ideal woman of many men of that period—insolent and provocative, yet one who, underneath her femme fatale exterior, really was a "regular Joe." In her first autobiography, Bacall writes that Hawks "wanted to be a Svengali." He created her voice, her manner, her persona, and quite by accident—because in her nervousness she could not keep her head from shaking—"The Look." Her chin was kept low. Her eyes stared up at a curious and fascinated Humphrey Bogart. 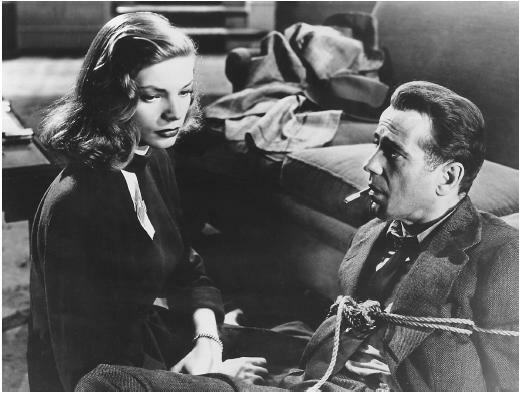 When Bacall told Bogart her now famous line—"You know how to whistle, don't you Steve? You just put your lips together and blow"—she emerged an overnight sensation. Her seductive portrayal of Slim in To Have and Have Not captivated audiences—especially male viewers. Her glamour and apparent sophistication were imitated by the women in the audience. Yet writer Moss Hart cautioned the burgeoning star, "You realize, of course, from here on you have nowhere to go but down." Hart's words proved prophetic. Bacall's phenomenal success was immediately followed by a crashing critical and box-office failure, Confidential Agent . Miscast as a British upper-class ingenue and lacking Hawks's strong directorial support, Bacall floundered. Jack Warner (who had bought her contract from Hawks) attempted to boost her career by building up her role in the already completed The Big Sleep (in which she was again directed by Hawks). Retakes and new scenes were added to this most confusing film, injecting the qualities that had made her famous—primarily her aloof bearing and on-screen chemistry with Bogart (who by that time she had married). Despite its narrative flaws, The Big Sleep was a box-office success, and Bacall was back on top. During her tenure at Warner Brothers she starred in only seven films—four of them with Bogart. The fan magazines reveled in the Bogart-Bacall relationship, which only added to their growing popularity as a screen team. Nevertheless, Bacall continually fought with Jack Warner over her assignments, rejecting properties she did not feel would advance her career. This resulted in a series of contract suspensions. One disagreement in particular made headlines when the actress announced she could not be cast in the frothy comedy The Girl from Jones Beach because it required her to appear in a bathing suit. After leaving Warners in 1950, Bacall experimented with a wider range of material, succeeding at both comedy ( How to Marry a Millionaire ) and high drama ( Written on the Wind ). Her beloved Bogie died in 1957; four years later, she married Jason Robards Jr., and her screen appearances became even less frequent. It was not until the 1970s, when Bacall made the transition to character actress, that her work in films took on a new direction. While not incapable of offering solid performances (as she did in the John Wayne Western The Shootist ), Bacall too often has come to play herself—a sophisticated, cosmopolitan woman of taste—in such films as Mr. North and Ready to Wear . Concurrent with her film career, she has appeared in series television ( The Rockford Files ) and television movies ( Perfect Gentlemen , Dinner at Eight ), and has lent her distinctive voice to many commercials. Her work on stage is noteworthy—particularly her performances in the comedies Cactus Flower and Waiting in the Wings and the musicals Applause and Woman of the Year . In 1996, Bacall enjoyed a critical resurgence with what was by far her best screen role in years (if not decades). In Barbra Streisand's The Mirror Has Two Faces, she played yet another urban sophisticate, this one a self-centered Manhattanite. But here, the part was meaty, not merely window dressing but a major component of the story. As a result, Bacall won kudos and awards for her knowing performance. Three years later, she appeared to lesser effect as a madam in Diamonds , in which she was teamed with Kirk Douglas. The two had been friends since the 1940s, and their pairing served as a nostalgic nod to the glories of Old Hollywood star power. Today, Bacall remains one of few surviving major stars of the 1940s, having worked in Hollywood's Golden Age with such luminaries as Bogart, Hawks, John Huston, Gary Cooper, Lionel Barrymore, Edward G. Robinson, and Vincente Minnelli. Her two autobiographies, combined with her performance in The Mirror Has Two Faces , serve as the finishing touches to her career. As she nears eighty, Bacall offers proof that you can get old without losing your looks, or your sense of style.